The Patriots are thin at defensive end; Jabaal Sheard has left via free agency and Chris Long has said that he isn’t coming back in 2017. The team did pick up Kony Ealy from the Carolina Panthers in a trade. That leaves him, Trey Flowers, Rob Ninkovich, and Geneo Grissom. Flowers came on and was fantastic down the stretch and into the playoffs. Ninkovich seems to be on the downside of a very solid career here in New England. Grissom was strictly a STs guy. So, they’ll need to add some depth. Edge rushers are like cornerbacks, you can never have too many good ones and the team is expecting Flowers to continue to improve on his 2016 season. Ealy has flashed and had an incredible Super Bowl with Carolina but hasn’t been able to do it consistently. The Patriots have plenty of options but as of today, they don’t pick until the third round. 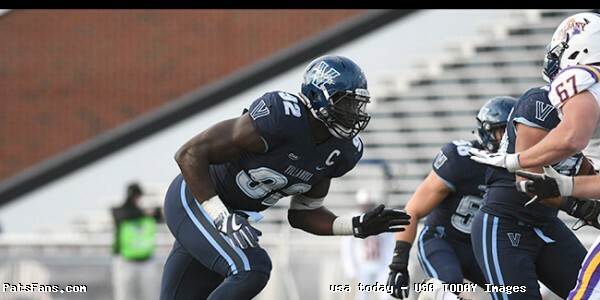 Tanoh Kpassagnon from Villanova is a fantastic athlete with tremendous size and very long arms that can play on the edge. He may be the most intriguing ‘Nova prospect since Brian Westbrook to come out of All-Colonial Athletic Conference. He was an All-American in 2016 with 21.5 tackles for loss and 11 sacks, 1 pass defensed, 1 forced fumble and two fumble recoveries. He shows on his tape that he has a very good short area burst, he changes direction well for a man his size and can block kicks in the STs. Kpassagnon measured out a 6’7, 289 pounds at the Combine and has 35 5/8 arms which helps keep opposing offensive linemen away. His large frame can handle getting even larger, he could easily measure out at 300-305 with no loss of athleticism. He showed that he could two-gap albeit at a lesser level of competition. He’s still a bit raw with his pass rush moves but flashes his potential with his freaky athleticism. He’s very intelligent and mature and is set to graduate with a double major of accounting and economics. Kpassagnon’s role would be to be a part of the rotation outside for the Patriots defensive line. He’d project initially as a sub-package pass rusher to add depth and fresh legs to the Patriots pressure on the QB. But with some coaching, he could find himself pushing for more reps and possibly kick inside as an interior pass rusher. Yes, with improved ability to set the edge in the running game, some strength added in the weight room and being coached up, he could develop into an impressive pass rusher. Limited to field goal and extra point blocking units for now. Kpassagnon is an intriguing project. He has tremendous size and length coming off of the edge. But he’s still raw and will take some time to develop to reach his full potential. He’d primarily be a third down specialist and play STs in his rookie year and gradually work his way into the rotation. He’ll need to get a bit stronger and could possibly pack on another 10-15 pounds of muscle on his frame before he can take on the tackles in the NFL. But his arrow is moving upward, this is a guy who is just scratching the surface of his potential. Once he works out his issues with his balance and plays under control, Kpassagnon could be this classes version of Jason Pierre-Paul. He has good lateral quickness and has shown the ability to be a disruptor in the backfield. He got off to a slow start in his college career and he’s not yet reached his ceiling. Kpassagnon should around in the 4th round of the draft. If he’s there, the Patriots would have the option of picking him up. He could become part of the rotation on the edge and even provide a big interior pass rusher on obvious passing downs. Whatever team drafts him will have to be patient, however, it will some time to see what he can really do. This entry was posted in 2017 NFL Draft, Patriots Commentary and tagged 2017 NFL Combine, 2017 NFL Draft, 2017 Patriots Season, Bill Belichick, Chris Long, Jabaal Sheard, New England Patriots, NFL, Patriots, Patriots edge rushers, Rob Ninkovich, Tanoh Kpassagnon, Trey Flowers on March 29, 2017 by Steve Balestrieri. 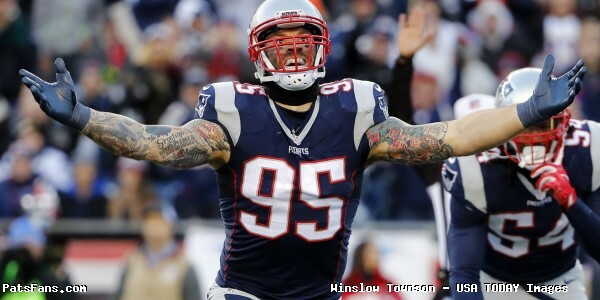 Happy Birthday to Chris Long, who headlines March 28 in New England Patriots’ history. The Longs are one of the premier NFL football families. Chris’ father Howie is in the Pro Football Hall of Fame, and his brother Kyle is a starting RG for the Bears. At Virginia Chris Long was a unanimous All-American and first team All-ACC. He was also the ACC Defensive Player of the Year, and won the Ted Hendricks Award for the nation’s best defensive end. The St. Louis Rams selected Long with the second overall pick of the 2008 draft. Long was a steady starter on a solid Ram defense for several years. However he missed ten games in 2014 with an ankle injury and four more in 2015 due to a knee injury. Upon his return Jeff Fisher kept William Hayes as his starter, leaving Long as a situational reserve. The Rams had previously restructured Long’s contract which created a cap number of $14 million for 2016. Not surprisingly he was cut as one of several cap saving moves. Long visited with Dallas, Washington and Atlanta, and then signed a one-year deal for $2 million with the Patriots on March 18, 2016. Having previously cashed in with two large contracts, Long was secure with leaving some money on the table in order to play for a Superbowl contender. After eight years of wallowing in St. Louis Ram mediocrity, Long finally not only experienced a winning season but also the playoffs and a Superbowl victory. Though it did not show up in the stat sheet Long did have key plays in the improbable comeback victory over Atlanta. On one key play his bull rush over Jake Matthews applied pressure from the right, so Matt Ryan could not turn that way. This was on Dont’a Hightower’s oft-replayed strip sack and fumble recovered by Alan Branch. That play may have been a big reason why Long was able to draw Matthews into a holding penalty on the subsequent drive. That flag resulted in a loss of ten yards and kept Atlanta out of field goal range. It was one of several plays that was the difference between a Superbowl win or loss. Long played in every Pats game in 2016, with seven starts. However his playing time decreased as the season progressed. In the first eight games Long was in for about 70% of the defensive plays, averaging 49 snaps per game. Down the stretch that dropped to just over 50%, averaging 34 snaps in the final six games of the regular season. In the playoffs Long had 27 snaps versus Houston, 20 plays (29%) against Pittsburgh and then only 15 snaps in the Superbowl. With that in mind it is understandable that he has elected to explore other options in free agency. Long finished the season with 35 combined tackles (22 solo), four sacks, three passes defensed and one forced fumble. Despite his short time in Foxboro all of Patriot Nation is grateful for his hard work and contribution. Off the field the Chris Long Foundation’s signature project is The Waterboys. It unites NFL players and fans to raise awareness and funds with a goal to install 32 deep borehole wells in East Africa. Each well costs $45,000 and serves up to 7,500 people. 3/28 12:05 pm update: Long has reportedly signed a contract with the Philadelphia Eagles. Like many pro athletes, Caldwell excelled in multiple sports as a youth. In high school he threw 77 touchdown passes and also set several school records in baseball. He was drafted by the Cincinnati Reds in 1998 but opted to play football instead. Caldwell stayed in state and went to the University of Florida. There he played for Steve Spurrier at the end of the Fun-n-Gun era. On offense he played alongside future NFL players such as Rex Grossman, Jabar Gaffney and Earnest Graham. Caldwell finished his junior year with 65 receptions for 1,059 yards and ten touchdowns. San Diego then selected him in the second round of the 2002 draft, 48th overall. He spent four years with the Chargers, never quite living up to his draft status. Over that span Caldwell had 76 catches for 950 yards and seven touchdowns. Following the 2005 season Patriot free agent David Givens signed with Tennessee. Troy Brown would soon turn 35. Depth at the wide receiver position needed to be replenished, and the Pats signed UFA Caldwell. At the same time Deion Branch was in the last year of his rookie contract. He held out and was eventually traded after lengthy and bitter negotiations. Rookie Chad Jackson injured his hamstring in training camp. Rather than being a third or fourth option at WR, Caldwell was suddenly by default forced to be the primary receiver. In that 2006 season Caldwell had 61 receptions (on 101 targets) for 760 yards and four touchdowns. The playoffs started well as he caught 12 of the 15 passes thrown his way over two games, for 130 yards. That included a TD against his old team in a 24-21 victory at San Diego. Caldwell was targeted nine times against Indy, catching just four passes. At one point Caldwell muffed a perfectly thrown pass in the corner of the end zone. Then with under ten minutes to go and the score tied, Caldwell was left uncovered on a botched Colt defensive assignment. Brady threw to Caldwell for what should have been an easy catch and an 18 yard waltz into the end zone. Caldwell became overanxious and turned too soon – even though no defender was remotely close to him – and dropped the ball. Two plays later he was unable to catch another pass and the Patriots had to settle for a field goal. The Colts came back to win the AFCCG 38-34. The NFC was weak that year; the winner of that game was the defacto Superbowl champion. It was a huge missed opportunity for the Patriots. Bill Belichick retooled his offense the following season with the additions of Randy Moss and Wes Welker. Caldwell was cut on September 3, 2007 and spent one final NFL season with Washington. His post-NFL career did not go well. Caldwell returned to his old Tampa neighborhood and opened up a gambling parlor. His problem was that it was successful, and he never considered that perhaps he should keep a low profile. After the inevitable arrest for bookmaking and running a gambling house, Caldwell posted bond. He kept hanging out with his old crew and saw how popular Ecstasy was at the clubs. Caldwell made the absurdly foolish decision to buy some Molly over the internet as his next business venture. That resulted in a 27-month prison sentence. The 6’1, 240 lb linebacker went to college at Tennessee-Chattanooga. He was one of the replacement players in 1987 when the NFLPA went on strike. Moore started in all three of those replacement games, with one fumble recovery. With his brief NFL career over, Moore returned to his native Georgia. He is the owner of Elite Realty Specialists. Wagner was with five different teams over nine season in the NFL. With the Browns in 1997 he led the league in number of punts with 97; the following season he led the NFL with four punts blocked. He signed with the Patriots in 1991 but was released after three games. Wagner was averaging a mere 29.1 net yards on his 14 punts. The Patriots re-signed him in 1995. He punted 37 times over eight games, with a carer-high 42.1 yards per punt. He now teaches phys ed and is a high school football coach in Ohio. Doig is a New England native. He was born in Melrose, played hockey at North Reading High School and went to the University of New Hampshire. At UNH he was the ECAC player of the year. Detroit selected Doig in the third round of the 1982 draft, 69th overall. Over three seasons with the Lions he appeared in 34 games with four starts. The Patriots signed Doig in 1986, after he had not played at all the previous season. 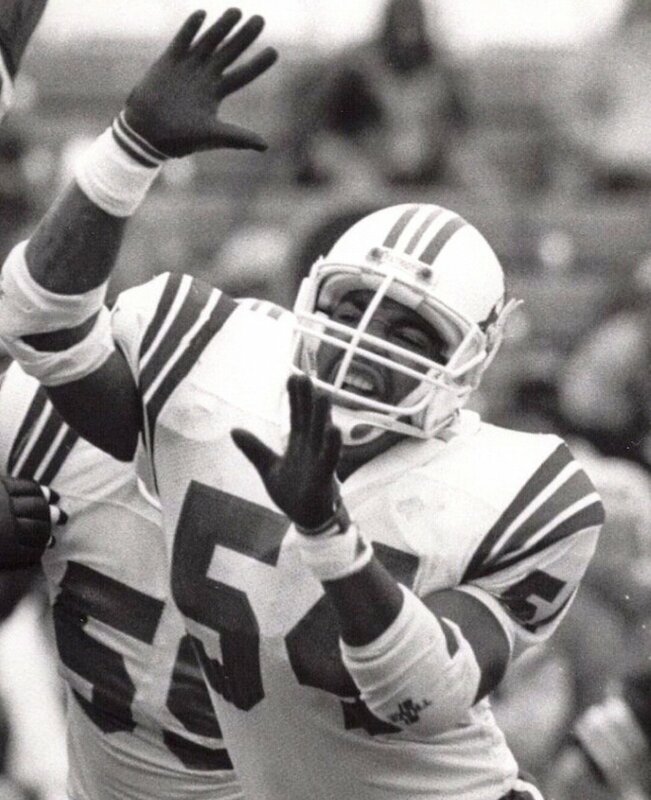 He played in five games for the Pats in ’86, and one more in 1987. Doig also appeared in the playoff loss to Denver following the 1986 season. The Pats waived Doig on September 8, 1987. Doig’s biggest highlight came in the last game played at the Orange Bowl. In the ’86 season finale Doig recovered a fumbled kickoff to give the Patriots the ball at the Miami 24. On the next play Craig James fumbled the ball away, and Tony Eason injured his shoulder making the tackle. Steve Grogan replaced Eason and later threw a 30-yard touchdown pass to Stanley Morgan with 44 seconds remaining. That gave the Patriots a 34-27 victory, and the AFC East title. This rebel belter from Lookout Mountain, Tenn., enters his third pro season with best prospects ever … lost last season with a knee injury … otherwise would have been a regular … is one of the surest, toughest tacklers on Patriots team … is one of Coach Holovak’s best on the suicide squad … was brought to Boston’s pros by fellow Chattanooga alumnus Charley Long … was Williamson All-American and AP second team All-American in ’63 … has a real taste for action … intense competitor … injury free season could give Lonnie a shot at All-Star honors. 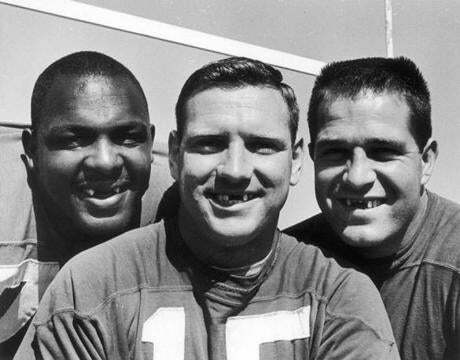 Left to right: defensive tackle Jim Lee Hunt, safety Ron Hall, and linebacker Lonnie Farmer. Geno Atkins (29), five-time Pro Bowl DT for Cincinnati Bengals. NaVorro Bowman (29), four-time All Pro LB for San Francisco 49ers. Derek Carr (26), two-time Pro Bowl QB for the Oakland Las Vegas Raiders. There is only one March 29 Patriot birthday, so I will insert it here. Calloway is most well known for seven years with the Giants. He was their leading receiver for four straight years. Calloway had receptions in a team record 47 straight games, and at the time he ranked third in franchise history with 334 receptions. He was originally drafted by Pittsburgh in 1990, but only spent two seasons with the Steelers. In 1999 the Giants released Calloway, attempting to get younger and also save money. Calloway signed a $4 million contract with Atlanta, which was very big money at that time. He caught only 22 passes and the Falcons let him go after one season. During training camp in 2000 Bill Belichick axed Vincent Brisby and signed Calloway. By that time though he was 32 and his best days were behind him. Calloway appeared in seven games with two starts for New England. He had only five receptions for 95 yards while with the Patriots. The Pats cut him on October 21, 2000. Calloway finished his NFL career with 386 receptions for 5497 yards and 30 touchdowns. Earl Campbell (62), Houston Oiler Hall of Fame running back. Ryan Kalil (32), Carolina Panther five time Pro Bowl center. Justin Tuck (34), two time Pro Bowl defensive end. This entry was posted in Patriots Milestones, Patriots News and tagged 2016 Patriots season, 2017 Super Bowl, Boston Patriots, Bryan Wagner, Chris Calloway, Chris Long, former New England Patriots, Greg Moore, Jeff Fisher, Lonnie Farmer, New England Patriots, New England Patriots History, Patriots history, Pats, Pats Alumni, Reche Caldwell, St. Louis Rams, Steve Doig on March 28, 2017 by John Morgan. Good morning, here are your Sunday’s Patriots news 3-26, & AFC East Notes. Although I’m glad that the FBI and the Houston Police were successful in reacquiring Tom Brady’s jerseys and got them returned to Foxboro as well as catch the culprit, doesn’t it seem a bit over the top with the resources used to find it? I wasn’t aware the one from the Seattle Super Bowl was missing as well. One must wonder if the culprit will get credentials this upcoming season. The Patriots have made a lot of moves during free agency, signing some free agents, bringing back a few of their own and adding other players via trade. But with almost $27 million in cap space, there’s no reason that the team cannot continue to build depth and add some impact players in free agency. Just because things slowed down on the free agency front, don’t think that Bill Belichick and company are done. There are still plenty of good players available and some of those may still end in Foxboro. With the cap space available, they have the option of adding free agents that are still out there and spending to the limit or rolling over whatever cash they have left after the draft and adding UDFAs to the 2018 season. That may not be that far-fetched. If they keep Jimmy Garoppolo, then the cost of franchising him will not be cheap. It will be interesting to watch how much they roll over into next season. The rumors that the Patriots are going to sign CB Darrelle Revis “at any time” refuse to die. So perhaps there is some truth to those rumors, however, I don’t see that happening. As we spelled out here about a week or so ago, the Patriots wouldn’t be served well by bringing Revis back. His level of play has slipped badly, he’s no longer a top corner, the Patriots are better served by sticking with Stephon Gilmore, and further developing young players in Eric Rowe, Jonathan and Cyrus Jones and deciding on whether they hold onto Malcolm Butler. We’ve heard the rumors as well about Revis moving to safety. First of all, it was Bill Belichick that said that his skill set didn’t lend itself to moving there. But even if they did, who do you sit? Devin McCourty? Duron Harmon, who the team just re-signed? He’s not going to be a strong safety so Pat Chung is out too. Time for this rumor to go. The White House announced that the Patriots will visit on April 19th. The tradition is for the champions to be welcomed and honored by the President. White House Press Secretary Sean Spicer made the announcement on Thursday and now the only question remains as to how many members of the team will opt to show up to meet President Trump or decide to sit it out. 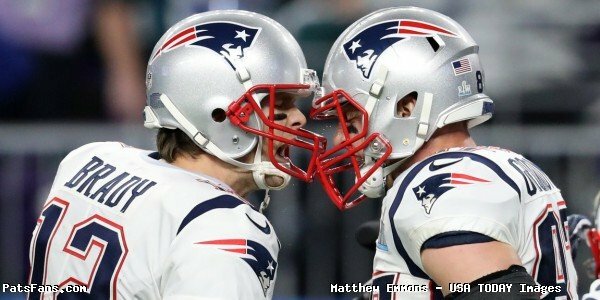 Six players from the 2016 Super Bowl team, (Alan Branch, Chris Long, Dont’a Hightower, Devin McCourty, LeGarrette Blount, and Martellus Bennett) have all stated that due to either political or personal reasons they will not attend. Some interesting news this week was that a proposed rule change that will be voted on at the League Meeting in Phoenix this week will be that teams be allowed to wear an alternate helmet in a color to match their third uniform. That would allow the Patriots to wear the “Pat the Patriot” uniforms and helmets again, which were banned in 2013 in the name of player safety as alternate helmets required a break-in period. For my money, the white jerseys with the red pants and the Pat the Patriot helmets were the best uniform that New England has ever worn. Nothing else comes close. Not that it would ever happen, but I’d love to see them go back to that setup full time. It was 46 years ago, this week, on March 25, 1971, the Boston Patriots changed their name to the “New England Patriots” although at the time, it wasn’t a big deal, it has gotten more important as time goes along. The Sullivan family who owned the team at the time wanted to change the name from Boston to New England in part because the city of Boston balked at building the franchise a new stadium. Sullivan had just finished building his new facility down in Foxboro on Route 1. There was an intriguing post on ESPN by Pats beat writer Mike Reiss on Saturday morning about the importance of Danny Amendola. While many in NE are writing Amendola off with the addition of Brandin Cooks. Reiss made the very astute observation that this may be premature. Amendola doesn’t possess gaudy numbers, but like we’ve said here more than once, the NFL isn’t a fantasy football league. In big games when the chips are on the line, Amendola has proven himself, time and again, to be clutch. 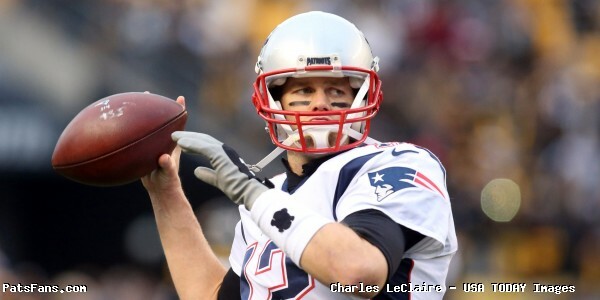 More importantly, he has Tom Brady’s trust factor, something that can’t be overlooked. 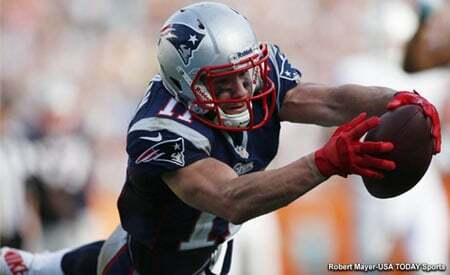 In the past two Super Bowls played by the Patriots, Amendola has caught 13 passes for 126 yards, two touchdowns, and an all-important two-point conversion. In the playoffs for New England, he’s returned nine kickoffs for a 23.7-yard average and four punts with a 13.5-yard average. Amendola’s current cap hit with a salary of $6 million will not fly this year, especially with him being a 4-5th option in the passing game. But if he’s amenable to another reduction, and all indications are that he is, he’ll be welcomed back. 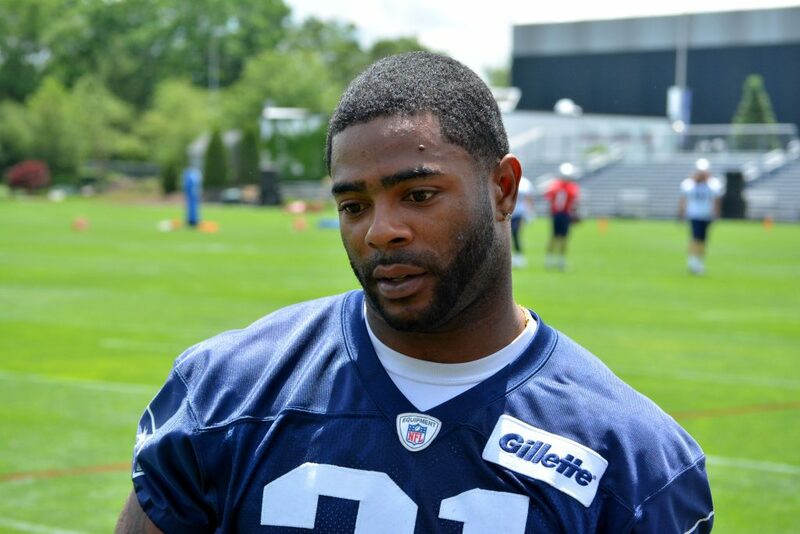 There is nothing new on the Malcolm Butler front, we do know he met with the Saints and afterward, NO coach Sean Payton raved about Butler to the press. Then Butler posted a picture on Instagram of himself sitting on a plane with the quote, “Nothing’s changed but the change” which was a line from a rap song. It immediately set off social media on a conspiracy theory burn that lasted the rest of the day. Anyone can interpret that to mean any number of scenarios. As many as there are possible outcomes in his contract stalemate. People are still reporting he may be dealt as early as this week, and although that may be true, Butler isn’t going anywhere until he signs his free agent tender. The Saints and Patriots can’t even discuss a possible trade for him until he does sign it. New Orleans isn’t going to sign him to an offer sheet because, at that point, they run the risk of either losing Butler back to New England if they match. But more importantly, they risk losing their top draft pick #11 to the Patriots if they decline to match. While I’ve always enjoyed Schein’s takes, I respectfully disagree with this one. Taylor has done little with the passing game. Buffalo averaged 189.7 yards per game thru the air. They were 32nd in attempts and 30th in yards. I’ve yet to see Taylor put the team on his back and carry them to a win. The Bills only success in throwing the ball has been when they’ve run it very effectively. I do agree with Schein that Sean McDermott will change the culture quickly up in Buffalo. And it should prove to be interesting. The Miami Dolphins and the Oakland Raiders are the two teams that have hosted linebacker Zach Brown, the former Bills free agent. It is rumored that Brown will choose between one of the two in the next few days. Brown, 27, led the Bills with 143 tackles and added 4 sacks, an interception and two forced fumbles in 2016. He is reportedly seeking $6 million dollars per year. It is reported by Armando Salguero of the Miami Herald that the Dolphins are only offering in the $3-4 million-dollar range. Brown would upgrade a Miami unit that struggled in 2016. However, they’ve re-signed Kiko Alonso and signed free agent Lawrence Timmons in free agency. Brown would add another solid veteran presence. The New York Jets made a couple of deals this week, re-signing T Ben Ijalana to a new deal. Ijalana, 27, started the first 13 games of his career in 2016 while appearing in all 16 games. Playing both RT and LT, the 6’4”, 332-pounder totaled 868 offensive plays and 925 overall snaps, ranking fourth most on the offense and fifth most on the team respectively. The team also signed free agent WR Quinton Patton from the San Francisco 49ers. Patton, 26, set career highs last season with 37 catches and 408 yards, playing 68 percent of the offensive snaps for the Niners. He’ll join Eric Decker and Quincy Enunwa as the primary WRs for the Jets this season. This entry was posted in 2017 Free Agency, 2017 NFL Draft, NFL Commentary, Patriots Commentary and tagged 2017 free agency, 2017 NFL Combine, 2017 NFL Draft, 2017 Patriots Season, Bill Belichick, Buffalo Bills, Chris Long, Danny Amendola, Dont'a Hightower, Jimmy Garoppolo, Malcolm Butler, Martellus Bennett, Miami Dolphins, New England Patriots, New York Jets, NFL, Patriots, Tom Brady on March 26, 2017 by Steve Balestrieri. 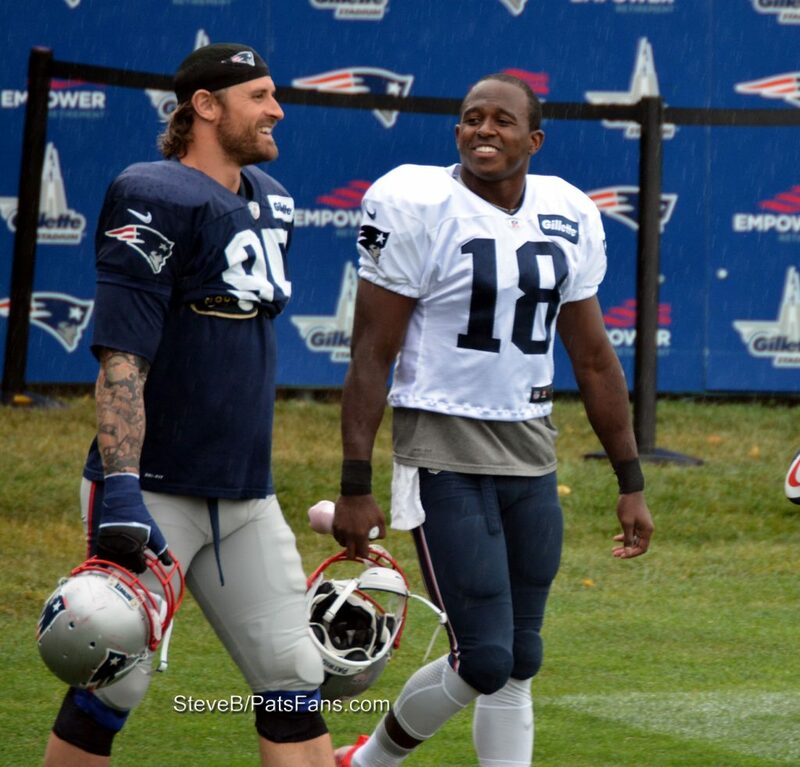 Good morning, here are Sunday’s Patriots news 3-19, & AFC East Notes. Some guys just seem to pay attention more…was it just me or did Kony Ealy get the memo before ever stepping on the practice field for the Patriots? In his introductory conference call with the Patriots’ beat writers, Ealy must have mentioned the catch phrase “Do Your Job” about half a dozen times. If Bill Belichick was listening, he must have been smiling. The Patriots have been one of the most active teams in free agency, but entering the period with $60 million in cap space and a slew of free agents this season, it really shouldn’t come as a big surprise. They’ve already addressed several spots on the roster and with nearly $27 million remaining in salary cap space, they have the flexibility to still be active. 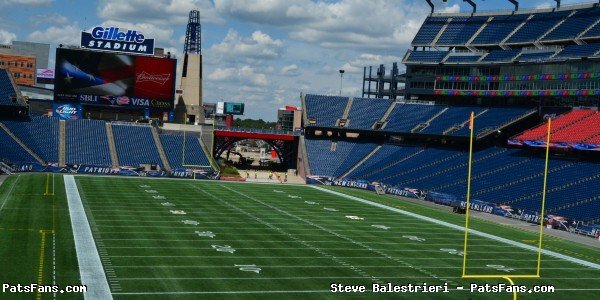 With free agency and the draft coming up next month, what are some of the areas still needing additional depth for New England? The feeling here is DE, RB (big back), S, LB, CB. Malcolm Butler met with the Saints this week and afterward, New Orleans coach Sean Payton spoke highly of the Patriots restricted free agent cornerback. But don’t expect the Saints to be making him an offer anytime soon. That situation would be the easiest for the Patriots, they could either match Butler’s offer or refuse to and get the Saints first round draft pick, which is #11 in the upcoming draft. There’s been some significant talk of the Saints offering the #32 pick, which the Patriots shipped to New Orleans for Brandin Cooks. The Patriots put a first round tender on Butler so that’s where negotiations would begin. Will Bill Belichick dig in his heels for the #11 pick? Doubtful and the Saints will not want to pay that for Butler although he is a legit Top10 corner. Giving up the 32nd pick is where they’ll start. Will the Patriots want the equivalent value of #11 with 32 and added value? Or will they accept a package of picks later down the line? Ultimately the decision Bill Belichick is going to have to make is: Whatever the Saints decide to offer for Butler, is the value better than bringing him back under his $3.91 million tender? Then letting him play it out and walk next season in free agency and getting a 3rd round compensatory pick? This situation may play out until right before the NFL Draft. The Patriots let free agent LB Don’t’a Hightower test the waters in free agency as the Patriots talented and tough linebacker wanted to see what his worth was on the open market. Hightower has said that he was disappointed in the offers but was happy with his deal, a 4-year, $43.5 million-dollar deal that returns him to New England. Hightower received interest from the Saints, Titans, Jets, and Steelers with the final two making a push to sign the former #25 pick from the 2012 NFL Draft. Pittsburgh made an offer for him but told him that if he left without signing a deal, that the offer was off the table. It was then that Hightower decided to return to New England and remain a member of the Patriots. The comments coming out of Pittsburgh, however, were interesting. Ed Bouchette, one of the most respected writers from the Pittsburgh Post-Gazette seemingly took affront to Hightower rejecting the Steelers for New England. Bouchette wrote that Hightower “did the Steelers a favor” by rejecting their offer, calling him “overhyped’ and “overrated”. He said that the Steelers were better sticking with Vince Williams as their buck linebacker. He cited stats to back up his claim that Hightower wasn’t a big-time player. We’ll respectively disagree here. This isn’t the fantasy football league and anyone who has watched the Patriots knows the value that 6’2, 265-pound linebacker brings to the defense. It isn’t about just sacks. The Patriots defense isn’t that type, but just like Richard Seymour, Willie McGinest, and Vince Wilfork before him, his value to the overall defense can’t be denied. Just for kicks the leading sacker for the team was Trey Flowers with seven but New England’s defense was #1 in points allowed. And Hightower was the glue, in the middle. He’s more than an MLB/ILB, his sack of Matt Ryan in the Super Bowl came off the edge. The Patriots can and do move him around depending on the matchups. 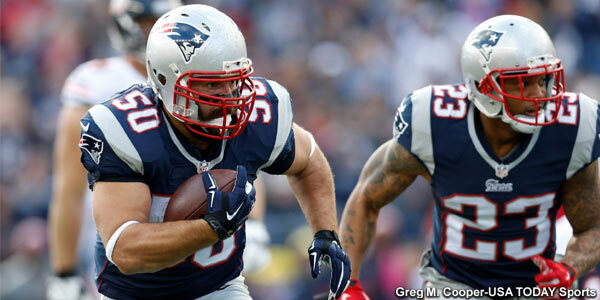 Belichick is surely happy to have his Pro Bowl/All Pro LB back in the fold. Overrated, overhyped and all. Another one of the Patriots under the radar signings has been the re-inking of safety Duron Harmon. Harmon returned to the Patriots with a 4-year deal worth $17 million dollars this week and it was a good deal for both sides. Harmon wasn’t a starter in his first four years here with New England but plays a valuable role in their ‘big nickel’ defense and has been productive. But most of all he loves it in New England and playing for Belichick. On a conference call with the team’s media this week, Harmon said the decision to return wasn’t a hard one. “I love it here. I’ve built a lot of relationships here with people outside of football. My kids go to school here and just being a part of this organization – it means a lot to me. I really love playing for this organization. I love playing for Coach Belichick. I love being a part of Mr. Kraft’s team. In the end, just coming back here really wasn’t a hard decision. It was something that I ultimately wanted to do. The Patriots other under the radar move this week was signing running back Rex Burkhead to a one-year deal worth $3.15 million dollars. He had a very solid season for the Bengals in 2016 carrying 74 times for 344 yards and adding 17 catches out of the backfield for 145 yards in limited action. He’s a tough, no-nonsense player who will play special teams, can run the ball between the tackles and catch out of the backfield. He’s got good vision and can cut back against the grain and follows his blockers well. But at 5’10, 210, he’s about the same size as James White and just slightly bigger than Dion Lewis, (5’8,195). The Patriots will probably still address the RB position; bringing back LeGarrette Blount or picking up another big back in the draft doesn’t seem out of the realm of possibility. But perhaps the coaching staff has decided that they know what works best for them. And having a trio of receiving backs that can run the ball a bit, (a fourth if you count D.J. Foster) and be very productive in the passing game may be the way they proceed in 2017? 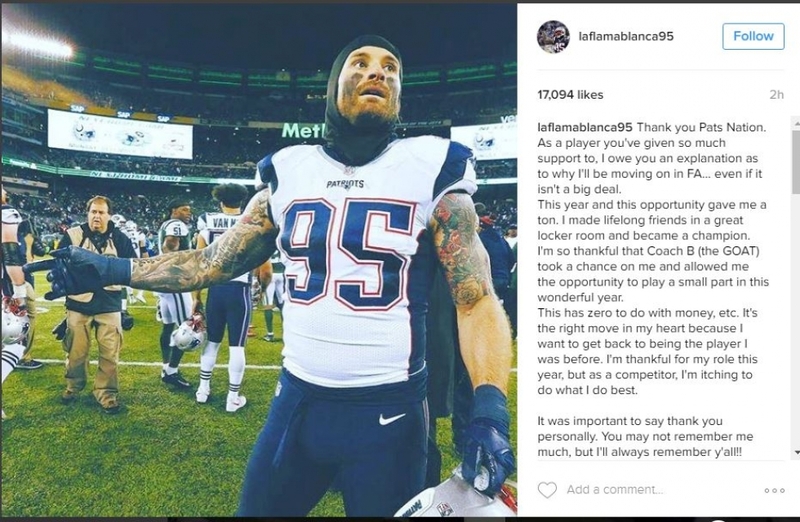 Former Patriots defensive end Chris Long just returned from climbing Mount Kilimanjaro in Africa and has yet to find a new team but has made it clear that he won’t be returning to New England just six weeks after winning a Super Bowl here. Long joined the MMQB podcast this week and explained his decision why he doesn’t want to be a situational player at this point in his career. He came across as honest and forthright and one can certainly respect his position. He did everything asked of him in 2016 and was well respected in the Patriots locker room as well as on the field. The Bills have just six draft picks this spring and with about 30 spots remaining on the roster to begin their offseason with the 90 players to begin OTAs, they’re going to lean on free agency as well as UDFAs after the draft is over. They began filling out their roster by signing three free agents on Friday, RB Joe Banyard, CB Leonard Johnson, and WR Corey Washington. Johnson as many will remember spent some time with the Patriots in 2015 and played in four games with three starts. He played well in a limited role. He also had a unique celebration dance on the team at the time. He played for the Panthers and new Bills coach Sean McDermott in 2016 and logged 22 tackles, a pass defended, and a sack after returning from injury a year ago. The Bills hold the #10 pick in the 2017 NFL Draft and after losing free agent Stephon Gilmore to the Patriots may be looking for help at corner, although they have numerous holes to fill. The Miami Dolphins are looking to improve upon a 10-win season and a playoff berth in 2016 and have been adding pieces to their team in the hope to keep the arrow pointed upward. The team signed longtime Pittsburgh LB Lawrence Timmons and also brought in TE Julius Thomas from Jacksonville and each will fulfill a big need. Timmons 32, plugs a big gap on the inside where the Dolphins were 30th against the run in 2016. He’s big and physical and came on the heels of a 2-year deal worth $12 million. One interesting fact is that the Patriots targeted Timmons the last two times the Patriots played the Steelers, however. So, this will bear watching two times in 2017. Miami lost the under-used and underrated Dion Sims in free agency but Thomas, if he can stay on the field, should be a very good replacement. They also brought back blocking TE Anthony Fasano as well as bringing back their own FAs Kenny Stills, Andre Branch, and Rashad Jones. It’s been a good start for HC Adam Gase’s second season. Jets “Concerns” With Hightower Didn’t Appear with Offer, Who’s at QB? The Jets made a concerted push to sign LB Dont’a Hightower in free agency. According to Jason La Canfora, they made a ‘significantly’ higher offer than either the Steelers or the Patriots. The reported deal on the table was for five years for $55 million with a total compensation worth $62.5 million. But after Hightower re-signed with New England, reports filtered out of the Jets camp by ESPN’s Rich Cimini that the Jets balked after giving Hightower a physical, citing his shoulder and knee issues and withdrew the offer. Smoking gun down the road, or just a smokescreen to cover a missed opportunity? The Jets meanwhile haven’t made any inroads on their QB situation. They reportedly aren’t interested in Colin Kaepernick who remains unsigned but have some interest in Jay Cutler and Josh McCown. Cutler is coming off of shoulder surgery and has never been able to put it all together, McCown? He’s lost 20 of his last 22 starts in the NFL. While Kaepernick has four playoff wins on his resume including a Super Bowl appearance where the 49ers narrowly lost. One has to question, as it would be in Boston where Robert Kraft’s friendship with President Trump is often cited, is the Jets’ non-interest in Kaepernick fueled by political leanings? After all, Jets owner Woody Johnson, like Kraft was a big supporter of Trump. And unlike Kraft, his friendship has gone completely under the radar. The President nominated Johnson to be the US Ambassador to Great Britain. Kaepernick has struggled the past few seasons but is more than equal to McCown and worthy of a look, unless he’s being blackballed for another reason. Kaepernick’s political leanings and very public feelings on race would be touted in Boston as a big reason why the Patriots would pass. Why isn’t that the case in New York? Things that make you go hmmm. This entry was posted in NFL Commentary, Patriots Commentary, Patriots News and tagged 2017 free agency, 2017 Patriots Free Agency, 2017 Patriots free agents, 2017 Patriots Season, Bill Belichick, Buffalo Bills, Chris Long, Dont'a Hightower, Duron Harmon, Malcolm Butler, New England Patriots, New York Jets, NFL, Patriots, Patriots edge rushers, Pittsburgh Steelers, Rob Gronkowski, Rob Ninkovich, Stephon Gilmore, Tom Brady, Trey Flowers on March 19, 2017 by Steve Balestrieri. The NFL is a passing league and the quarterbacks are the driving force in it. Some of the most important players on each team are the quarterbacks and those players trying to sack them. The Patriots will have some work to do to replenish their players on the edge in 2017. Prior to the 2016 season, they traded away Chandler Jones to the Arizona Cardinals. And now Chris Long and Jabaal Sheard are free agents and neither is likely to return. That leaves them with Trey Flowers who shined down the stretch for the team and steady, reliable veteran Rob Ninkovich, who is closer to the end of his run than the beginning. But the good news is, despite free agency starting this week, the NFL Draft will be chock full of talented edge rushers. There are several players available that may be of interest to the Patriots as either a defensive end or as an outside linebacker. We’ll list a few here, some have already been linked to the Patriots. While Miles Garrett is far above everyone else with his combine showing, forget about him coming to New England. His performance solidified what we already knew, he’s going to be the #1 pick and is heading to the Cleveland Browns. Ditto for Solomon Thomas from Stanford and Tennessee’s Derek Barnett. They should all be gone before New England is on the clock. And Malik McDowell who had a very good day at the Combine on Sunday? I think the Patriots pass on him, he doesn’t seem like their type of player with his lack of effort at times at MSU. Taco Charlton from Michigan is an athletic big man at 6’6, 277-pounds and can play on the outside or kick in to be an interior pass rusher. He had 9.5 sacks and 13.5 tackles for loss for a stout Michigan defense in 2016 and would be a great fit for what the Patriots love to do. Charlton is still filling out his massive frame and has possibly not even scratched the surface on his potential. Has the prototypical size, length, athleticism, to be a dominant pass rusher in the league. Carl Lawson from Auburn looks the part as an edge rusher in the NFL. He’s 6’2, 253-pounds with a chiseled upper body and had the most bench presses for defensive linemen at the Combine with 35. He also had the fastest time in the 20-Yard Shuttle Run with a time of 4:19. The shuttle run measures lateral quickness and agility. Lawson had issues with injuries in 2014-15 but he put it together for War Eagles this past season. He logged 13.5 tackles for loss and nine sacks. He has very good power off the edge and is aggressive. With his injury history, Lawson may drop into the 2nd round which would be a nice pickup for a team looking for an explosive edge rusher. Charles Harris from Missouri is a hybrid edge rusher who can be a DE/OLB at the next level. He ran a 1.65 split which is a good indicator of burst and explosion at the line. Harris is 6’2, 253, and has excellent agility and footwork. He was arguably the smoothest dropping into coverage and changing direction at the Combine on Sunday. Missouri has a history of producing very good edge rushers and Harris in 2015-16 showed what he can do. With 30.5 tackles for loss and 16 sacks in those two seasons, Harris is another intriguing prospect. He’s versatile can play defensive end on either side or stand up as an outside linebacker. Harris plays with a high motor and is very athletic. Kansas State’s Jordan Willis had a tremendous showing at the Combine and seemed to put to rest the concerns that he was too stiff and sluggish to be an effective edge rusher. Willis finished second among defensive linemen only to Myles Garrett in the vertical jump with a leap of 39 inches. 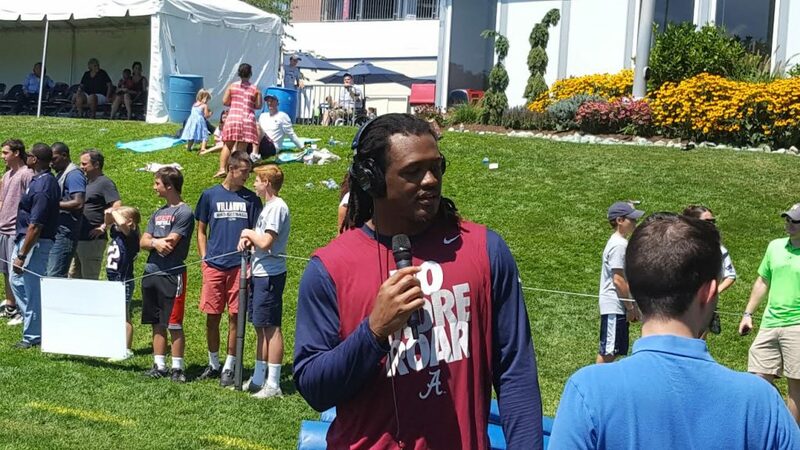 He finished second to Hasson Reddick in the 40-yard dash at 4.53 seconds. He won the all-important (especially to the Patriots), three-cone drill at 6.85 seconds and tied for third in the 20-yard shuttle at 4.28 seconds. When looking at his game tape Willis appeared to be a nice complimentary sub-rusher. But with his dedication to improving himself this spring, he’s shown that with some more time in a strength and conditioning program, and his impressive showing in the agility drills, he could become an impact pass rusher. His 10-yard split, which measures explosion off the snap at 1.54 was better than Jadaveon Clowney, Bruce Irvin, and Ziggy Ansah, via Mike Loyko NEPatriotsDraft.com. He really helped his own case on Sunday. Haason Reddick from Temple is truly a jack of all trades, he walked on at Temple as a defensive back, bulked up and moved to defensive end, and now will probably play linebacker in the NFL. He’s got the straight-line speed, he ran a 4.52 in the 40 on Sunday. He dropped into coverage for the first time at the Senior Bowl and turned scouts’ heads with how seasoned he appeared in coverage. He may play outside or inside linebacker in the NFL or possibly both. He could be an inside backer on early downs and slow outside as an edge rusher on passing downs. “I’m hoping to do both. I’m looking to take on a challenge. I want to dominate two positions.” He’s another guy that’s been linked to the Patriots and it is easy to see why. One dark horse player to take a second look at is Trey Hendrickson from Florida Atlantic. He’s another hybrid DE/OLB who turned some heads at the Shrine Game. He ran very well with a 4.65 time in the 40 with a blistering 1.59 10-yard split. He’s got good size at 6’4, 266 and showed his agility with a 4:20 time in the 20-yard shuttle and a top time of 11:43 in the 60-yard shuttle. He seems like a Patriots type of player, with nine sacks, 15 tackles for loss and four blocked kicks in 2016. 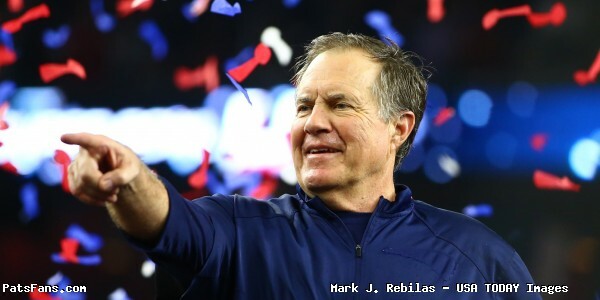 This entry was posted in 2017 NFL Draft, Patriots Commentary and tagged 2017 NFL Combine, 2017 NFL Draft, Bill Belichick, Carl Lawson, Chandler Jones, Charles Harris, Chris Long, Derek Barnett, Haason Reddick, Jabaal Sheard, Jordan Willis, Malik McDowell, Miles Garrett, New England Patriots, NFL, Patriots, Patriots edge rushers, Rob Ninkovich, Solomon Thomas, Taco Charlton, Trey Flowers, Trey Hendrickson on March 6, 2017 by Steve Balestrieri. The Patriots will part ways with veteran DE Chris Long and he will play elsewhere in 2017after winning a Super Bowl with New England. Long signed a modest one-year deal with the Pats in 2016, in part to having a chance to play for a winner and to reignite his game after the back-to-back injury plagued years. Long was immediately welcomed as an established, respected veteran in the Patriots locker room and seemed like a perfect fit both on and off the field. He signed for just $2.35 million dollars last spring and later said, he’d have played for nothing. He worked his way into being a starter in New England and played about 65 percent of the defensive snaps in the regular season. Long led the Patriots with 29 combined QB sacks (4), hits (8) and pressures with 17 in 2016. Although he played only 15 snaps in the Super Bowl against Atlanta, he had a big impact on the plays where he was on the field. He drew a key holding penalty with the Falcons in field goal range that could have iced the game for Atlanta. Instead, after the call, it knocked them out of range. He also was right in Matt Ryan’s face as well as Dont’a Hightower on the sack where Hightower stripped the ball loose late in the game. Long, a 6’3, 270-pound defensive end will turn 32 later this month. And although he’s closer to the end of his career than the beginning, still has enough left in the tank to bring another team a veteran, professional presence as a pass rusher. This entry was posted in 2017 Free Agency, Patriots Commentary and tagged 2016 NFL Season, 2016 Patriots season, 2017 free agency, 2017 Patriots free agents, Bill Belichick, Chris Long, Dont'a Hightower, Jabaal Sheard, New England Patriots, NFL, Patriots, Patriots edge rushers, Rob Ninkovich, Trey Flowers on March 1, 2017 by Steve Balestrieri.